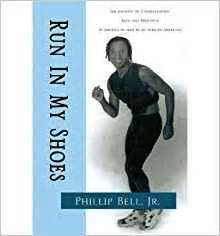 Run in My Shoes was written by Professor Phillip Bell, Jr., MA. The focus of this narrative is to bring truth to one of history's greatest tragedies and sins. This book is written in a chronological historical inquiry concerning the narrative of the expansion and enslavement of darker skin people from Africa by Europeans, It highlights some of the ideologies, human pain, suffering, and an institutional control over a people deemed as chattel just because of skin color. The hope is to draw readers into his passion of accounting for America's historical Holocaust and contemporary set of facts concerning editorials about the arrival and treatment of the Black Race enslaved as beasts of burden all for profit while using Christianity to sanction the practice. The book further showcases the evil genius of setting up of the American Peculiar Institution, the legacy of White Supremacy in America past and present in hopes of educating the hearts and minds of many whom have ignorance, fear, and hatred for Darker people in America and worldwide. It is this authors intent to bring about a bold and brave plan of action from this book and sport invention to help America and the world towards developing a non-violent, spiritual, and intellectual practices. Shaping a new deal of positive strategies that will help this and future generations "overcome racism one day" as Dr. King stated very often during his ministry.